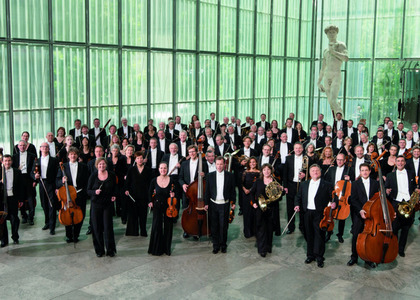 The oldest radio orchestra in the world - MDR Leipzig Radio Symphony Orchestra (from Germany) will perform at RadiRo - the only festival in the world devoted to radio orchestras! The oldest radio orchestra in the world - MDR Leipzig Radio Symphony Orchestra (from Germany) will perform in two extraordinary concerts in Bucharest during the RadiRo Festival (18-25 November) - the only festival in the world devoted to radio orchestras, an event organized and produced by Radio Romania every two years! Founded in 1923, the orchestra has its roots in a region which has seen the artistic influence of brilliant composers, such as Johann Sebastian Bach, Felix Mendelssohn, Richard Wagner, Robert Schumann, Franz Liszt, or Kurt Weill. During the fourth edition of the festival, together with other great European ensembles, the MDR Leipzig Radio Symphony Orchestra (from Germany) will perform at Sala Radio, in a concert conducted by Robert Trevino, one of the most appreciated young American conductors today. The artist was associate conductor at the New York City Opera (2009-2011) and at the Cincinnati Symphonic Orchestra (2011-2015). A promoter of contemporary music, Robert Trevino conducted, in a world premiere, compositions by renowned composers, such as André Previn, Phillip Glass, Jennifer Higdon, Sofia Gubaidulina. He is currently the music director of the Basque National Orchestra, and was recently named the main conductor of the Malmö Symphonic Orchestra. Monday, November 19th (at 7 p.m.), during the MDR Leipzig Radio Symphony Orchestra's concert at Sala Radio, the acclaimed Dutch violinist Simone Lamsma will perform for the Romanian audience, playing the original Stradivarius "Mlynarski" (1718) violin, a one of a kind world renowned historical instrument. The Dutch violinist has an extensive repertoire, including over 60 violin concertos, as well as an impressive collection of chamber music. Appearing on the most important stages in the world, and hailed by the critics, Simone Lamsma performed in Romania for the first time last year, during the "George Enescu" Festival, in a performance by the Les Siècles ensemble, conducted by François-Xavier Roth. This event's performance will include Max Bruch's Concerto no. 1 for violin and orchestra and Gustav Mahler's Symphony no. 5. Tuesday, November 20th (at 7 p.m.), during the MDR Leipzig Radio Symphony Orchestra's concert on the Sala Radio stage, the young Romanian pianist Mihai Ritivoiu, winner of the "George Enescu" International Competition, Piano Section, in 2011, will perform. Mihai Ritivoiu's debut album (with compositions by Cesar Franck, George Enescu and Franz Liszt), released in March by the "Genuin" record label in Leipzig, is leading the public's choice chart of the "Records of 2018" competition, initiated by Radio România Muzical. Mihai Ritivoiu performed in chamber concerts and other concerts in Romania, the U.K., France, Portugal, Switzerland and Italy, in venues such as the Romanian Athenaeum, St Martin-in-the-Fields, Wigmore Hall, Barbican Centre, West Road Concert Hall and Ernest Ansermet Studio. In 2015 he won the Golden Medal from the "Beethoven Piano Society of Europe", in London. At Sala Radio he will perform Serghei Prokofiev's Concerto No. 3 for Piano and Orchestra. During this event the public will also be able to listen to the symphonic poem A Hero's Life by Richard Strauss. All the concerts performed during the festival will be live streamed by Radio Romania, the recordings will be later broadcast by the Romanian National Television, as well as by other radio stations that are members of the European Radio Network. For additional information on the RadiRo festival 2018 visit: www.radirofestival.ro.